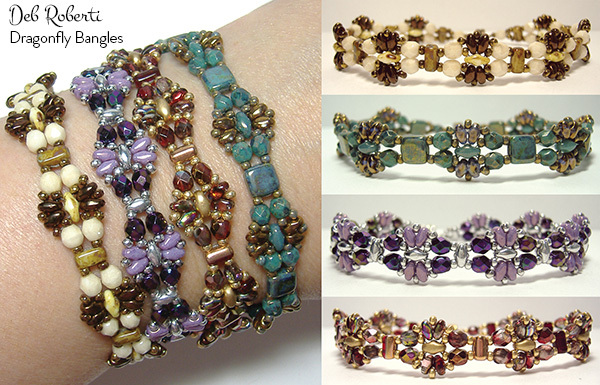 Free step-by-step illustrated instructions for an easy bracelet using size 11 seed beads, 4mm fire-polished bead, SuperDuo beads, MiniDuo beads and any Czech two-hole beads (Czechmates tile and brick beads, Rulla beads or more SuperDuo beads work best). Step 1: Thread your needle with 2-3 yards of FireLine (or start with a length that you feel comfortable with and add more later). 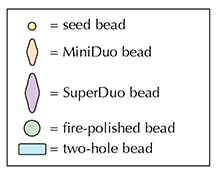 Step 4: String a seed bead, a fire-polished bead, a seed bead, a two-hole bead, a seed bead, a fire-polished bead, a seed bead, a SuperDuo bead, a seed bead, a fire-polished bead and a seed bead. Step 6: String two MiniDuo beads. Step 7: String two MiniDuo beads. Go up through the seed bead, the fire-polished bead, the seed bead and the right side of the two-hole bead above (highlighted in RED). Step 16: String a seed bead, a fire-polished bead, a seed bead, a two-hole bead and four seed beads. Step 18: String two MiniDuo beads. Step 19: String two MiniDuo beads. 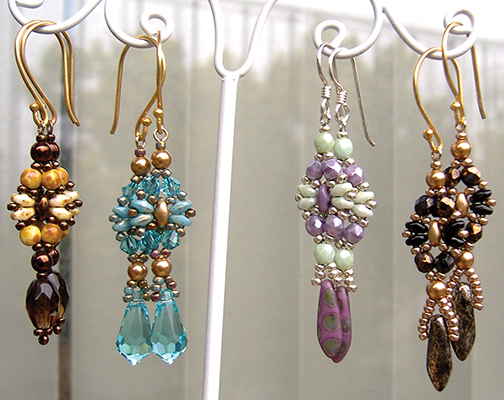 Step 26: To attach one end of the clasp, string a seed bead. Weave back into the bracelet, knot in several places and then cut your thread. Step 29: To attach the clasp to the other end of your bracelet, thread your needle with the tail thread from Step 1.